Monticello, home of Thomas Jefferson (Norm Shafer/for the Washington Post via Getty Images). As the country slowly, surely comes to grips with its slaveholding past, one of its most iconic buildings is set to do the same. The Washington Post reports that the room where historians believe Sally Hemings slept (just feet from Jefferson’s bedroom) was turned into a restroom in 1941. This was erhaps an oversight, perhaps it was done purposely. Hemmings has always evoked a visceral response from those who would not have one of our most famous president’s legacies—the man who wrote that “all men are created equal”—besmirched by a slave girl who bore children for him. 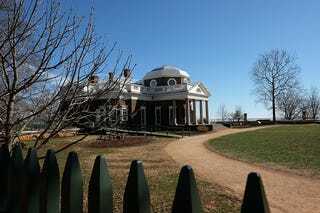 However, the Post reports that “Hemings’s life is poised to become a larger part of the story told at Monticello,” and her space will be open to the public next year. In addition, Monticello, a 5,000-acre working plantation, will now reconstruct buildings on Mulberry Row, where the enslaved lived and worked. Jefferson owned 607 slaves (easily worth over $2o million in today’s dollars) over the course of his life. “Thomas Jefferson was surrounded by people, and the vast majority of those people were enslaved,” said Christa Dierksheide, a Monticello historian. Today we do not have any historical record of how Hemings regarded her relationship with Jefferson. We know that Hemings was about 14 years old when her son alleged that her relationship with Jefferson began, supposedly in France (he was 44, and she was accompanying his daughter Maria on a 1787 trip to Paris). But given that she was underage and he “owned” her, many say that consent is something that Hemings could not possibly have given. The Post reports that for four decades, Jefferson kept meticulous records of every dollar he spent and the activities of the people he held as slaves—but that he rarely wrote of Hemings, a seamstress, possibly in an attempt to mask her role in his life. We do know that Jefferson freed Hemings’ children, and his family granted Hemings an unofficial freedom after Jefferson’s death. “You’re in the home of the person who wrote the Declaration of Independence, who criticized slavery but was a slaveholder,” said Harvard law professor Annette Gordon-Reed, author of The Hemingses of Monticello: An American Family. The story of Monticello is, at its core, “about the complicated nature of America’s founding,” she said.